In the exciting lead-up to the Nintendo Digital Event, the Nintendo World Championships took place last night, returning after 25 years. The entire show can be seen here on Nintendo’s channel. Some of us at Nintendo Scene have our own highlights and memorable moments that we’d like to share, and it’s fair to say that we were quite unanimous on our top picks. 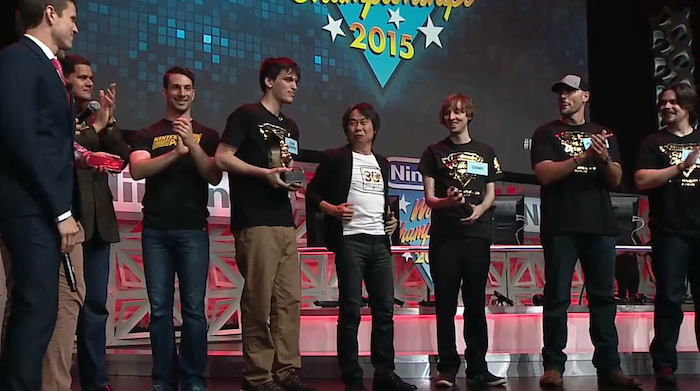 Never let it be said that I won’t admit when I am wrong; and I was wrong about the Nintendo World Championships. Although I stand by my opinion that it could have been far bigger, better and more impressive, the event itself was spectacular. My personal highlights were the incredible speed-run contest on Super Metroid (if only because it is one of my favourite games of all time) and the match a year in a making: the grudge match between Reggie Fils-Aime and HungryBox on Smash Bros. that started at last year’s Smash Bros. for Wii U Invitational Tournament. Other favourites of mine were the almost dismissive reveal of a new 3DS game, Blastball (football, in mechs, with guns – I know), and the wonderful Grand Final on levels created in Super Mario Maker by the Nintendo Treehouse team. It has been 25 years since the last Nintendo World Championships, and its return did not disappoint in the end (despite my scepticism). I thought the Nintendo World Championships certainly improved as the night went on. It was great to see Splatoon being played at the start and while I wasn’t overly keen on the method of coverage for that game, I warmed up to it all as the event progressed. It was a great idea to have the newer games kept for each round with speed-run challenges kept for the older games in the ‘underground’ stages. What I love about these events is just the hype it generates. I may not be present in person but I ride the wave so enthusiastically with a huge smile on my face it doesn’t matter. It was a fantastic touch to introduce each game just by the music before any visual cue; one of my favourite moments was hearing the intro to Super Metroid as the screen remained black, and the Super Metroid challenge that followed. It sent a chill down my spine to hear it, knowing that the competitors were about to race for survival on one of my favourite games. The final round made for a surprisingly thrilling watch; I must say I hadn’t been too interested in Super Mario Maker until I saw the levels presented in the final challenge. The possibilities seem endless and I look forward to designing some extreme levels myself! It was also incredible to see that Reggie actually kept to his word from last year’s Smash Invitational and challenged HungryBox to a Smash Bros match. The result did not disappoint, and the good-spirited trash talk between the two was hilarious. I’d happily welcome the Nintendo World Championships again, maybe not next year but certainly less than 25 years from now! Like Reuben though, if it were to happen again I think it should be on a global scale, inviting a larger number of competitors from more regions than just America. All things considered, an exciting show was put on display. We saw moments of great gaming skill (and some dire ones too) and now we’re all set for the Digital Event tomorrow! I can’t wait to go and watch it now. I wasn’t sure how it would go but I’m glad it was good. It is really cool seeing them bring back something from 25 years ago.